Hi – it’s the Customer Thermometer team once again excited to bring you yet more functionality we hope will make your lives even easier when using the service. As I’m sure you’ll know as a user of the service, until today, our unsubscribe functionality has not been as functional as we would have liked… The hyperlink click which sends an email to the account holder served its purpose, but we know it wasn’t the best solution. 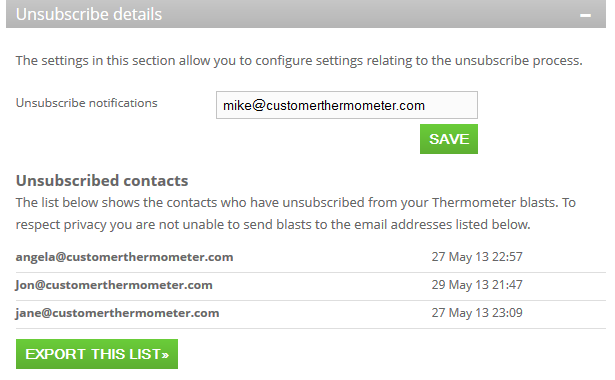 From today, any Thermometer you send will have our brand new unsubscribe functionality attached to it. 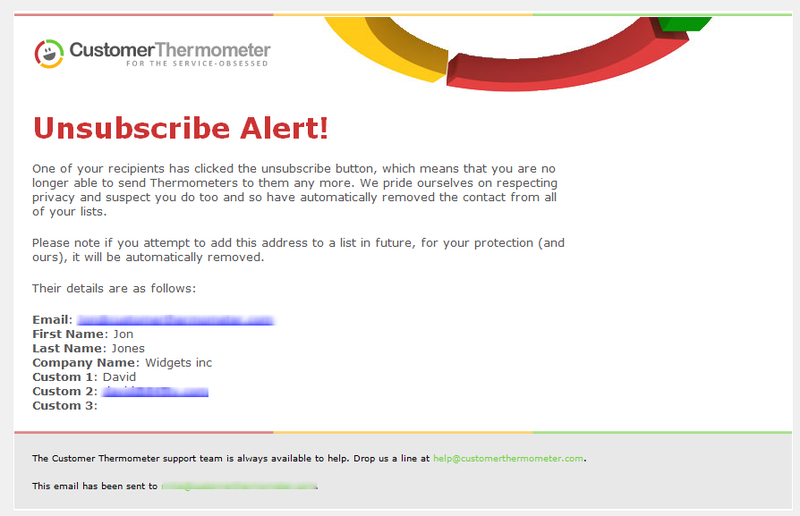 The link in the Thermometer looks identical, but should one of your recipients click that link, rather than an email popping up, they will now be taken to a landing page, confirming that they’ve unsubscribed and that the account holder will not be able to send a Thermometer, from that account, to them again. This now means that you won’t need to deal with the manual issue of removing people from your list(s) and running the risk of upsetting customers. From an account holder’s perspective, as soon as a recipient clicks the link, you will be notified by an unsubscribe email, telling you who unsubscribed. You can customise who receives those alerts in a new settings panel. By default, it will be the account holder. In addition, that recipient’s email address is automatically removed from all lists, as well as of course your master list. 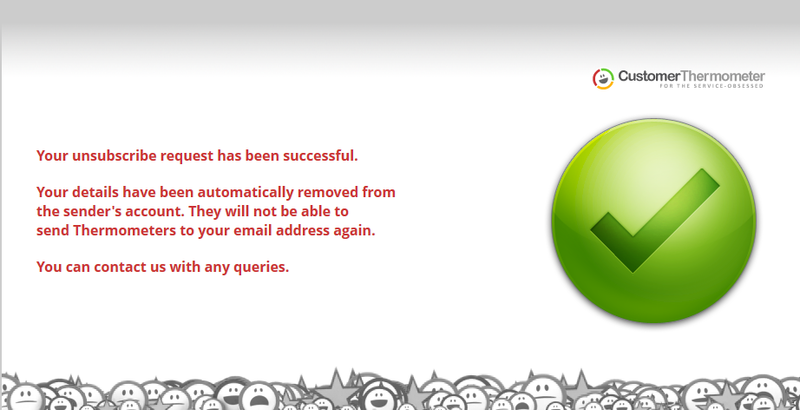 It would be easy to add that unsubscribed recipient back into a list, unknowingly one day, wouldn’t it?! Well, we’ve thought of that too. If you add an unsubscribed email address to a list in the future (via any of the three methods) you will receive a warning message, explaining that email address has been rejected. The system is now fool proofed, protecting you, the recipient and ourselves as an organisation. From a human perspective, if one of your customers has asked to be unsubscribed from an unobtrusive temperature check – surely, that’s worth having a conversation about – we suspect there could be bigger problems underlying? Here’s another feature we’ve been asked about on dozens of occasions now – an automated reminder blast. From exactly 3 days after a blast has been sent out (and before 14 days from original the blast timestamp) a REMIND button will appear within your reporting screens. Clicking it will automatically create a secondary blast to the recipients who’ve yet to click a response (shown as pending in your reporting). You have the ability to customise the subject line and to remove any recipients who you don’t want to receive the blast a second time. On confirming, the reminder blast will be sent and all clicks captured against the original blast report – boosting your response rates and customer feedback. Simple, yet effective we hope. Whilst adding these two additional features, we’ve also tidied up a few elements including comments within reporting, exporting functionality and exports now contain response delay information. In addition, we’ve further improved our new master lists – thanks to feedback from users. You are now able to upload via CSV contact data which contains email addresses already within the master list for your account. We’ve made a subtle change which means that if you upload a change to a field associated with that data, it will overwrite existing fields. In addition, if other fields remain blank in the new upload and field data already exists within your master list, that field data will not be replaced by blanks ie removed – it will remain as it was. To summarise, only new data fields will replace existing data fields… uploading blank fields will not remove existing data fields. 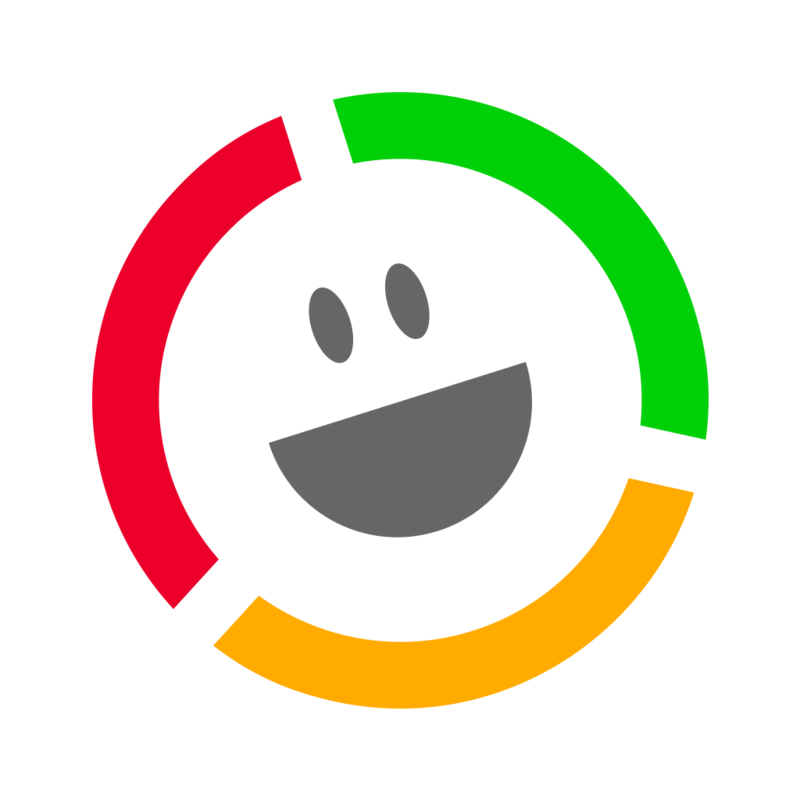 With the combination of our new features of version 1.7 a month ago and this new release of 1.7.1 today, Customer Thermometer has come a long way – we hope you get a lot from it. We aren’t stopping though – in the second half of this year, our focus is going to turn to integration – how to simply connect to other systems using our API – so any thoughts and feedback are welcome. 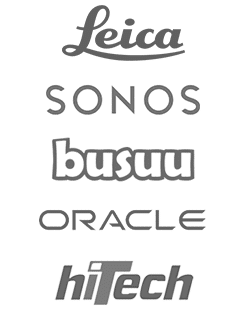 We’d be nothing without our amazing customer base – keep talking to us – and we’ll keep delivering. How to display live Customer Thermometer results on your Facebook page Getting low average online survey response rates?